The sunflower is a great example of how we should be steadfastly guided by light. What a powerful thought that this exceptional plant is not stuck in one pose day in and day out, yet adaptable and magnetized to the sun. We feel the same about our Son. 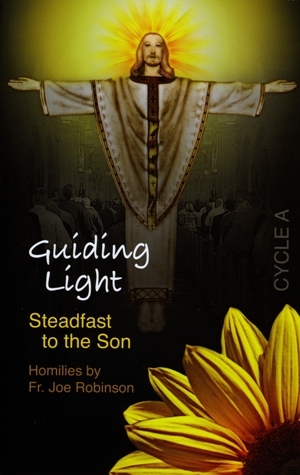 Our heads turns to face Christ as each day presents its challenges to find light. We join together like plants in a field and soak up the Son through the pulpit. We are a warm circle of strength using the wind of our breath to carry our priests' words, Christ's words, to new rich soil. Archdiocese in Ohio for over 40 years. His journey began at Elder High School, a strong foundation that led him to the Archdiocesan Seminary, the Athenaeum of Ohio. There he received Bachelor's & Master's Degrees in Philosophy and was ordained in 1964. He obtained a Master's in Divinity degree in 1973, followed by a Master's in Psychology degree in 1976. He has served in six parishes in the Archdiocese and has taught at McNicholas and Seton high schools. He holds a license as a Professional Clinical Counselor from the State of Ohio Counselor & Social Worker Board. Today, Fr. Joe is currently pastor of St. Boniface Church. He is well loved by the surrounding community and inspires his parishioners with the homilies found in these pages. They are not only practical but also filled with light humor and a sense of hope, the hope of living out the Gospel despite the challenges of today. May they be a guiding light for you as they have been for so many others.